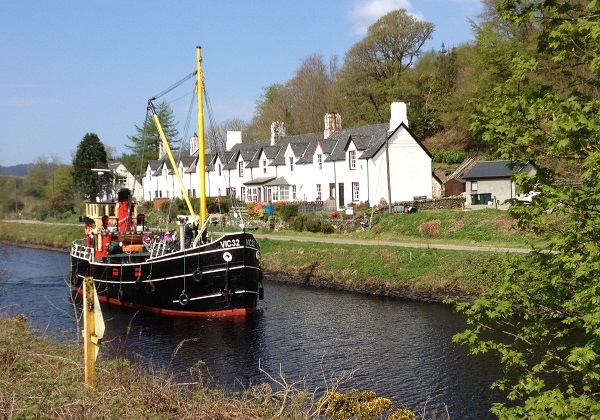 Cairnbaan Cottage - Self Catering Cottage on the Crinan Canal, Argyll, Scotland. Traditional Crinan Canal Cottage, ideally situated on the Canal Towpath. Relax in the garden while watching the yachts sail past on the canal. Enclosed garden with driveway for parking. Under 10 min walk to Pub/Restaurant. Well behaved pets allowed by arrangement. Located on the banks of the Crinan Canal in Cairnbaan, Argyll on the West Coast of Scotland, this charming traditional end terraced cottage is ideal for walking and cycling, particularly along the Crinan Canal tow path but also along the many nearby woodland tracks. Cairnbaan Cottage can comfortably accommodate 4 persons. There are two bedrooms (a double and a twin) an enclosed garden with driveway for parking. The Cairnbaan Hotel is less than a 10 minute walk from the cottage and serves excellent food and drink. Inside the cottage there is a kitchen/diner and a lounge downstairs. 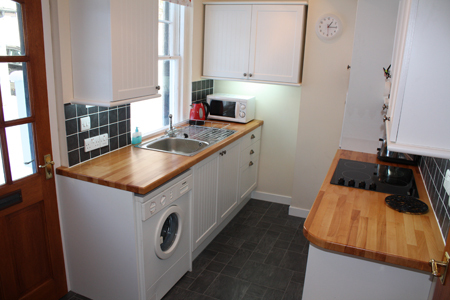 The kitchen has been newly fitted and includes an electric oven with ceramic hob, fridge freezer, microwave and washing machine. Off the kitchen is the dining area, with a table and four chairs. The cosy living room has an open log fire, a 2 seater sofa, 2 chairs and a window with views over the canal and surrounding countryside. There is a TV/DVD, stereo, video and Play Station 2 with a small library of DVDs, videos and PS2 games. There is also an under-stair storage cupboard. Upstairs is a bathroom with an electric over bath shower and two bedrooms. The main bedroom has a double bed, wardrobe, chest of drawers and great views over the canal and surrounding countryside. The second bedroom has twin beds, a chest of drawers and views out to the woodland to the rear of the cottage. Well behaved pets are allowed in the cottage living areas but only under responsible supervision and by prior arrangement. The enclosed garden is ideal for dogs but pets are not permitted on the furniture or in the bedrooms. Cairnbaan is about 3 miles north of Lochgilphead, Argyll on the A816 Lochgilphead to Oban road. Turn off the A816 onto the B841 (signposted Crinan), continue past the Cairnbaan Hotel and instead of crossing the canal road bridge, turn right (straight on) onto a single track road which follows along the side of the Crinan Canal. Continue on this road for about half a mile and after Lock No. 8, take the track to the right and about 50m along, you will see the cottage, first on your left. The gates at the side of the house lead into the parking area and garden.